Putting it Back Together . . . . .
With the concrete retaining wall finished, reinforced, and grouted solid, re-installation of the brick finish face proceeded quickly. Other than fitting cut brick around the through wall drain (and of course the final cleaning), the retaining wall portion of the work is finished. The wall is designed in a manner consistent with applicable codes and accepted practices, and unlike the original version, it sits on a proper footing, is correctly reinforced, and is tied into the adjacent retaining wall as well as the brick facing. New brick would be necessary for the reconstruction work. 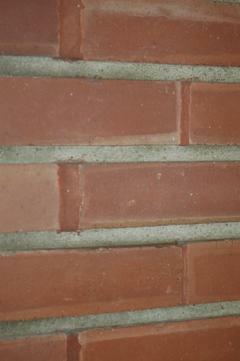 However, given that the existing brick was 71 years old, a perfect match was not likely. 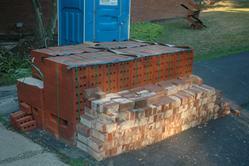 Therefore, as old brick came out of the wall, as much as possible was cleaned pre prepared for reuse. Some new brick was required however, and we were actually able to locate the manufacturer who made the original brick and match it perfectly, right down the grade stamp. 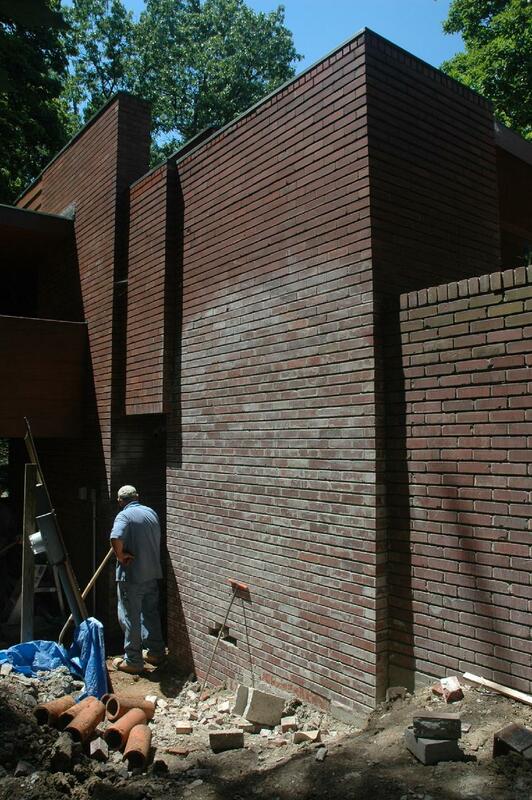 Given that the new brick looks new, we mixed it in as needed, using one brick here and there throughout the work. When used in that manner, the color difference, which looks striking in the photo, is virtually unnoticeable. Note the cores are well back from the face of the brick. Given that the bed joints are deeply raked (see the description below), the larger than normal distance between the face and the cores ensured that moisture would not penetrate. With a more traditional brick, we would have expected to see face damage with that sort of joint. 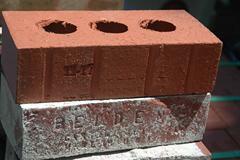 Whether the selection of brick with that core configuration was intentional or merely fortuitous will never be known. Initial efforts to remove the stairs proved ineffective due to the fact that the concrete proved to be far thicker than anticipated. 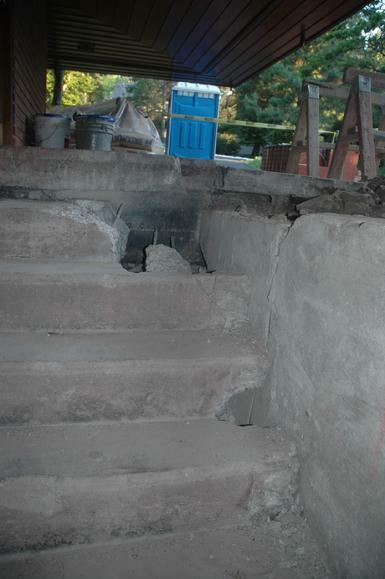 Again, the jackhammer created far too much vibration and was necessary to cut the stairs and the retaining wall into small pieces to facilitate removal. 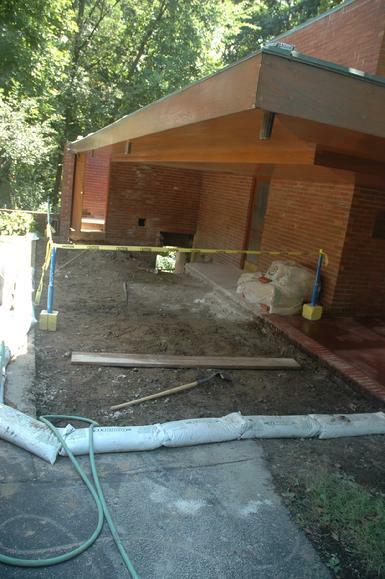 The deteriorated concrete slab under the overhang was removed and the site prepped for installation of a new slab with a brick edge consistent with the original design. The wall on the left in this photo is a basement wall for the house. 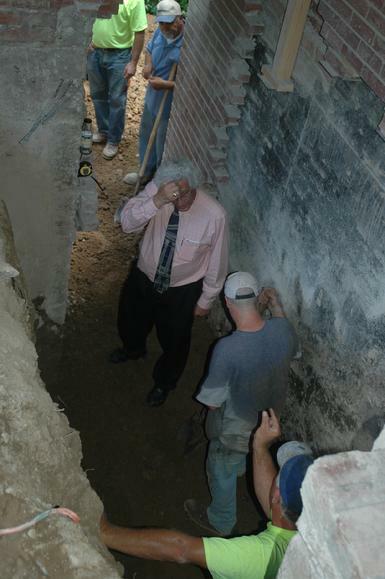 While the brick was sitting on the concrete steps instead of some sort of footing, we did expect that excavating the basement wall would reveal a spread footing wide enough to rest the brick on. 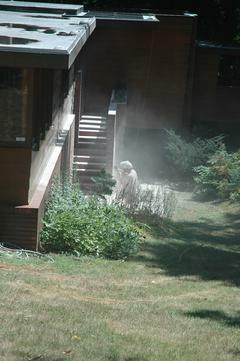 Surprisingly excavation didn't reveal one, leaving one to ponder how the basement concrete wall had been constructed. 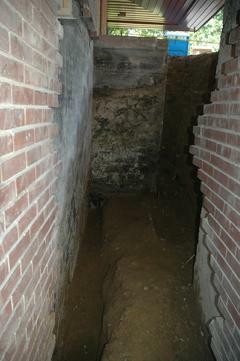 This photo is taken from the opposite side - the wall on the right is the basement wall here. Rather than continue digging and risk undermining the wall, we stopped digging, drilled into the concrete and set steel dowels with epoxy, and poured a concrete footing extension to support the new brick at the proper elevation. By contrast, on opposite side (the left in the photo) we didn't expect to find a footing at any depth as the concrete wall there was shallow and earth to a substantial depth was found beneath it. 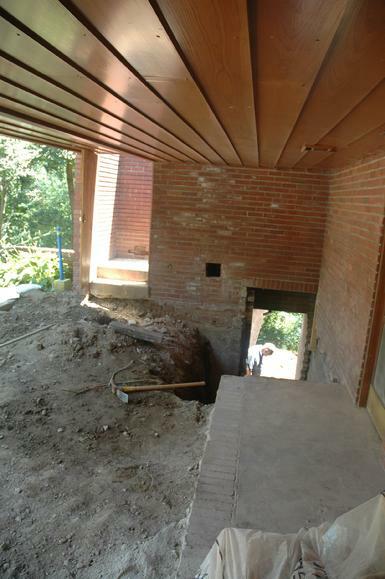 However, when we excavated to the necessary depth, we found a spread footing complete with steel dowels necessary to receive a new retaining wall in the proper location. While that proved fortuitous, why that footing was constructed and then abandoned without being used remains a mystery. With the footing and foundation issues figured out and corrected, a proper retaining wall was constructed on the North side (left in this photo), and re-installing of the brick began. 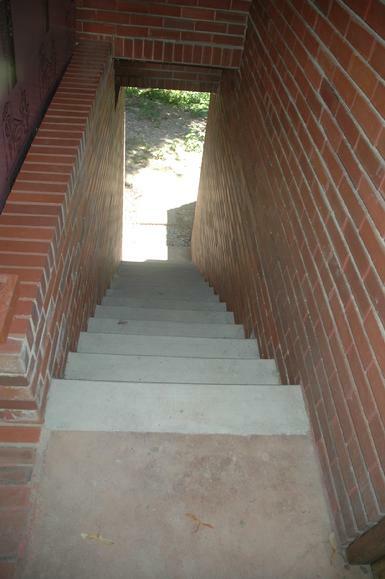 Brick was used only above the stair line where it would be exposed in the finished construction. Below the stair line where the construction wouldn't be visible anyway, 4 inch concrete block was used to bring the brick ledge up to the proper elevation. 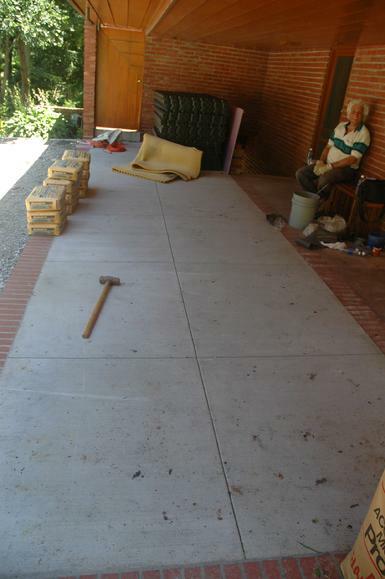 Sub-base preparation is completed for the new slab. The new concrete slab with the brick edging consistent with the original design is complete. 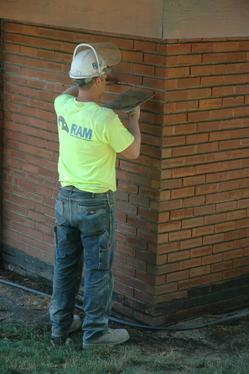 The brick edging lines up with the overhand above. Masonry work included complete tuck pointing on the entire structure. All mortar joints were probed and any loose areas were cut out with an angle grinder back to solid areas to provide a sound shoulders for the ne mortar to grip. With the loose mortar cut out and the joints thoroughly cleaned, new mortar is forced into the open joints to restore a firm, weather tight exterior. The mortar exhibits a typical Wright detail. The bed (horizontal) joints are comprised of regular grey mortar and are deeply raked while the head (vertical) joints are comprised of mortar colored to match the brick and are struck flush with the adjacent brick. The net effect is to accentuate the horizontal lines while minimizing the vertical lines. In the original construction this was often accomplished with the use of two different mortars - one colored and one natural. Since we didn't replace all of the existing mortar that approach wasn't possible, so instead we applies a mortar stain to all of the head joints after the new mortar had thoroughly set.